I didn’t know what I had till it was gone. During my PhD at the University of Pittsburgh, I had access to the Scopus database of citation data. I proceeded to use it for various citation analyses. I graduated and moved on, swapping that university affiliation for a collection of at least five others. None of these has access to Scopus. I miss it! I need it to do my research! Why? I’m working on a large scale citation analysis. This would be easy with ISI Web of Science if my collection were based on a particular journal, or an author last name or one of your other small set of field tags. It isn’t. Instead it is based on an interdisciplinary domain, and includes thousand of articles across hundreds of journals and authors and subjects. I keep track of my cohort of articles through their PubMed identifiers. ISI Web of Science doesn’t allow query by PubMed ID (or DOI, or any other unique article identifier number). Google Scholar isn’t up to the task either. Scopus allows me to query for the citation histories of these articles by their PubMed ID (or, alternatively, doi). Furthermore, I can do this across a large number of Scopus articles by ORing the PubMed IDs together, say 500 at a time. Kind of a pain, but easily done in parallel with watching a movie, so no problem. I won’t bore you with the details, but I’m jumping through all sorts of hoops to gain access to Scopus. So far my trek has involved getting fingerprinted and sending away for an FBI police record check to obtain visiting researcher status. In parallel I’m taking advantage of a work trip to stop by the British Library in person. I haven’t succeeded yet (I apparently need access to the British Library Reading Rooms. They are closed on Sunday, as I type this from the lobby of the British Library), but hopefully I’m getting close. Dear Scopus, you know what would make this a lot easier? The ability to buy a personal subscription. I’d buy one. I have money for that. Unfortunately, you only offer access through institutional subscriptions. I’ve talked to librarians at many of my institutions, and they aren’t keen to buy an institutional Scopus subscription… they view it as an upstart “European” also-ran to ISI Web of Science. You and I both know that isn’t true, but it is a really steep hill for me to climb to convince them, as an individual postdoc researcher. Let me have a free personal trial, let me buy a personal subscription. fwiw, as I’ve described before, neither Scopus nor ISI Web of Science is currently equipped to provide the citation-history of datasets (though Scopus is closer because it supports query by DOI). As far as I know, there is no API access to Scopus or ISI Web of Science or CrossRef that allows me to do this sort of data collection programatically (I’d love to be wrong! Tell me if I am wrong!). Bulk programmatic access is powerful, and it *is* possible through PLoS and PubMed Central to their publication subsets. I wish it could be available for all articles. I’d pay. The demand for article-based metrics is growing as more people realize that evaluating research articles by their journal impact factor is harmful and irresponsible. Existing tools, you aren’t ready! If it was the opposite – you needed access to WoS – you could do that through DIALOG with transactional pricing. Scopus isn’t available through DIALOG which is a shame. 1) Find free scientific article (or a free version version) not indexed in Google Scholar. Users’ search queries are automatically expanded with synonyms/acronyms. Example: Search query “DNA” has the following equivalent alternatives: “deoxyribonucleic acid”, “desoxyribonucleic acid ” or “ADN”. 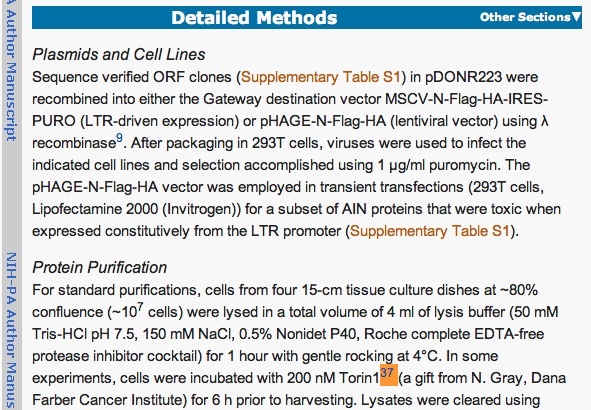 You can refine your search results by article, patent, thesis or poster. In conclusion, FreeFullPDF will not replace Google Scholar, but it appears to be a good complementary tool for scientific research.